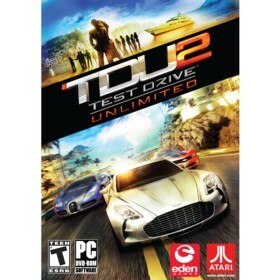 Test Drive Unlimited 2 is a PC game in the Driving genre. The game was published by Atari and developed by Eden Games. The game has an ESRB Rating of T (Teen 13+) and was released on 2011-02-08. The game's official site can be found at www.testdriveunlimited2.com. I was invited to join a Weekend Beta test for TDU2 by IGN. I accept and downloaded the game (5 Hours!). The launcher looked nice and was modern. Then I started the game. After a long time loading (2 mins) the Start screen came up. Into the game I go. As it was my first time on any of the Test Drive Series, I didn't know what to expect. I started by spawning in the main capital of Ibiza with a 1960s Mustang. I hated the car and went to the map. This is a great piece of the game. Its not just open the map, choose the place and teleport there. TDU2's map zooms out from where you are until it shows Ibiza, then when you choose where you want to go/teleport, it will load you there, then zoom into the game world. I only had 8 cars to test, which were: Audi Q7 and TTRS, Chevy Camaro, Aston Martin DBS, Ferrari California, Lancia Delta, The Mustang, and Ford GT. The Q7 was a great surprise, having a massive V12 engine and having to be limited to 155 mph, in a 2+ ton monster. The TTRS was a good gripy car, but lacked in speed. The Ferrari California, now a personal favourite of mine, was great in the corners and had the speed. Both the DBS & GT were full of power, but no grip. TDU2 brings lots of new multiplayer features to the game. Co-op Mode, where you invite someone to sit in your passenger seat while you drive. Clubs have improved with Clubhouses and more events for your members to drive in. It will be a great purchase. The only other game ready to challenge it is NFS World, and thats nothing compared to TDU2. TrackMania 2 may challenge it, but it is no longer free. It will probably be challenging for the game of the year. Great graphics, if you have a good card, however a bit slow when responding to direction changes. If you do buy it, go to the club section on TDU2 forums and look for VSDC and join it.